"Never apologize for showing feeling. When you do, you apologize for showing truth." "Look, if you think of us on the edge of the Milky Way, we're nothing. So let's tell as much as we can. The more the better." NB: The new DSM-5 was just released in May of this year. There has been some revision of Depersonalization Disorder which is finally recognized as a primary syndrome unto itself (as well as being secondary to a panic attack for example). The definitions of some of the disorders below may have some minor changes as well. Please bear with me while I update these links. Diagnostic codes and categories have also changed to be more in synch with the current ICD published by the World Health Organization. Though my primary diagnoses at this time are both Depersonalization Disorder and Generalized Anxiety Disorder (and I have chronic depression), the most disturbing feelings for me are the two severe perceptual distortions DP and DR. When I first saw a psychiatrist at age 16, I didn’t even realize that my anxiety and depression were significant or profound; I simply begged the man to help me with this “feeling weird” that interfered with every aspect of my life. He explained (in a few sessions) that the “weird feeling” was called depersonalization. He noted that I was also severely anxious and depressed. I think I believed that the depression and anxiety were somehow a “normal experience” for me. I sought help for “feeling weird” and that alone. These dissociative symptoms remain the most disabling for me and truly sap the joy out of my life. I suffer from both DP and DR. Others describe suffering from one or the other or with some fluctuation between the two. In simplest terms the difference between DP and DR are as follows. I have also provided my experience of Social Anxiety Disorder, GAD and Panic Disorder. I have not provided a description of my depression. I will only say, it is not “the blues” or “feeling down”; it is a chronic feeling of despair, lack of motivation, feelings of hopelessness, sometimes feeling I no longer wish to live as I am so limited by my illness. Depersonalization - A distortion in how one's own body and Self feel. Derealization - A distortion in how the external world is perceived. Generalized Anxiety Disorder - my current primary diagnosis. Panic Attacks - episodes that have come and gone my entire life. There are many theories on my DP and DR and I often ask myself, “Which came first, the anxiety, the depression, or the dissociative feelings?” I really can’t answer the question. I can only hazard a guess that in my case, I have a predisposition to dissociate (to easily disconnect from my “Self” and the world), however DP and DR are most often seen as symptoms secondary to anxiety and other illnesses. Over the years my symptoms of DP/DR have been seen as “the least of my worries” and they remain the most devastating and horrifying to me. Having DP and DR 24/7, all of the time, even in my dreams, seems to indicate it is a disorder unto itself (as I see it in my particular case) . These were perhaps initially a symptom of panic and anxiety that were later a conditioned response; they took on a life of their own and would then be called Depersonalization Disorder. This has yet to be sorted out by medical research. At some point in my early teens I started using a scale to measure the severity of my DP/DR symptoms. I used a spectrum of 0% to 100% -- 0% being completely depersonalized/derealized to the point of having “disappeared completely from reality,” and 100% being normal or “100% in the real world.” I was last 100% in the real world, most of the time, around the age of 11. In retrospect, I know I suffered "feeling odd" on and off throughout my childhood; during these times I avoided social activities or sometimes dreaded them. I firmly believe now I was experiencing episodic DP and DR that was "uncomfortable" at minimum. This measuring-stick still frightens me as when I think I have hit rock bottom I will often find there is a level further down the scale -- this has occurred over a span of 30+ years. I cannot contemplate where these serious dips fit on my scale and really don't care to speculate. Fortunately these "drops into Hell" or "into The Black Pit" (a term coined by the protagonist in I Never Promised You a Rose Garden) have lessened considerably with medication, therapy, coping skills, and time. Presently I would say that I am about 60% "here" most of the time, 24 hours a day, 7 days a week; I still have DP and DR in my dreams as well and it is interesting and disturbing that much of the time it is significantly worse than in my waking state. This is still a tremendous improvement from levels of what I would guess were 30-55% "here" as an adolescent and young adult. I am often amazed by what I accomplished in those early years but I was young and strong and hopeful then and had very specific dreams and goals that made me fight harder than I have been able to as an adult. What is frustrating is that any form of pressure or stress, which now can be as simple as going out with a friend causes a significant increase in my anxiety, depersonalization, and derealization and it is often difficult to determine which came first -- anticipatory anxiety or severe and intrusive existential thinking. My DP and DR seem to increase or decrease in tandem so it is difficult for me to really separate the level of DR/DR; they are generally one and the same. The derealization is always worse outdoors. Over the years I have used an endless number of metaphors and analogies to explain my DP and DR to doctors, family, and friends. For someone who has never experienced these feelings they are almost impossible to understand. My mother of course knew exactly what I was talking about though she would not tell me what it is, or allow me to get help. I often pose the following questions to a healthy person who has not experienced chronic DP or DR: "Have you ever experienced déjà vu?" The response if often "Yes" and is described as an uncomfortable fleeting shift in perception -- somewhat odd, but not troubling. I then ask, "Imagine if an experience like déjà vu never went away, if it came on with an intensity 100 times greater that what you have ever experienced, if that perceptual shift remained for the rest of your life?" Most healthy people have some minimal grasp of that concept and agree that at minimum it might be "disturbing" if it persisted. Unfortunately, most healthy people have absolutely no clue what I am talking about. I ask, what is this "lump of flesh" that is "Me"? Other DP sufferers describe this very well as a "stinging existential angst" yet this is not a manifestation of some philosophical, intellectual exercise (such as a Sartre-like discussion re: the nature of "being"). This is endless questioning about the nature of my very existence, and the thoughts seem to come in tandem with my perceptual distortions. This is also not “solipsism syndrome” -- another misunderstood philosophical contract. I can't say the thoughts can be separated from the actual physical experience of depersonalization but if I dwell on these thoughts and focus too much on my body, my symptoms of DP can increase and become unbearable. I really can’t say which comes first -- the thoughts, the perceptual distortions, or the anxiety. I feel at all times that I am dreaming, or more specifically that I am half-awake and incapable of pulling myself into reality. When interacting with others I feel as though they are on the other side of an invisible barrier or pane of glass. I feel I can't connect with them though I hear, see, and understand what they are doing and saying. I of course appear "perfectly fine" and "normal" to those interacting with me. I NEVER believe these feelings are real. I know I shouldn't feel the way I do; I want these horrible sensations to go away. In psychiatric terminology my "reality testing is intact." I have "insight" into what's happening to me and know it shouldn't be happening. I am not delusional or psychotic in any way. I use the metaphor of "Static on a Radio." When moving from station to station on a radio, one moves from the complete clarity of one station into static. Then as the dial turns, a new station comes in, first garbled then finally clear. I liken my presence of Self "in the world" as moving away from the clear station, further and further into the static. I am "less here," just as the clear radio station disintegrates into garbled static. I describe this loss of Self as my "Xerox Metaphor." Take an original document and Xerox it. Take the Xerox of the document and Xerox that. Continue to Xerox each Xerox. The original document slowly fades away. This is how I feel my Self fading away. My arms often feel they are not attached to my body, as though they are not mine. It is as though I have phantom limbs that I can see. This is most disconcerting as one's arms and hands are so crucial to so many daily activities. This sensation waxes and wanes and is exacerbated by various kinds of stress. I frequently feel certain areas of my body are "numb" or have "gone to sleep." Everyone is familiar with sitting on one's foot, cutting off the circulation and having it "fall asleep." I have somewhat similar sensations that occur mostly on my right side, on my cheek and on my arm -- but again I don't believe these parts of my body have actually gone numb. The numbness feels as though it only reaches down about a few millimeters into my skin. I will sometimes rub these areas to "wake them up" knowing very well this is again some irritating somatic symptom I have no control over though I know I shouldn't feel that way. When my DP is at it's worst, I don't want to move as it feels so odd, my body is not mine, I actually can't feel my body, it feels nonexistent -- it is though I am "merely a pair of eyes" and nothing more. I talk in a whisper as I feel my voice is not mine. The world presses against my face and my face has a burning sensation. I feel as though I am only a thought -- the only thought in existence. The world exists only in my own mind. I keep asking, "Who am I? Why am I here?" Though my "reality testing" is always intact; if someone asked me my name, where I was, what year it was, etc., I would be able to answer those questions. I haven't "lost my mind," I have "lost my sense of Self." I can also equate this horrible feeling with being an astronaut, floating in space, only in a spacesuit. There is a visor in my helmet, but there are no stars, no light at all, only darkness, I can see nothing. So all "I" am again, is "existence" -- in nothingness. My depersonalization usually remains at a relatively constant level. However, under stress I experience serious dips in my sense of being in the world. Sometimes the stress is obvious such as preparing a presentation or even getting ready for a party or meeting with a friend for lunch. At other times there is no apparent stressor. The DP (and the DR) will come over me in a wave and I will fall into a "lesser" reality. Imagine having a stroke where you have lost all of your physical senses. You are completely paralyzed. You are blind, deaf, and cannot speak. You cannot feel your body -- at all; should someone touch you, you would not be aware of it. You cannot move (and even if you could you would have no point of reference as to where to move or how). You are being kept alive by the most advanced medical care you pray would be terminated -- but you cannot communicate in any way. And you are fully aware that you "exist" -- you only exist. You are conscious. Your mind is still working. You can think. You are perfectly sane. You are simply thought, trapped in a vessel. This is how I feel in my most horrible moments, fully aware that I should not feel this way. I can understand why someone would seek pain (with cutting -- though I do not do this) to find some sense of ... anything ... actual proof that one is alive. These experiences convince me that this is clearly a neurological event of some type -- some miscommunication in the brain which provides us with a sense of "Self". This is a stunning example of dissociation during a stroke as experienced by a neuroscientist. Her description of an extreme episode of DP/DR is absolutely spot on; I know exactly what she is describing. 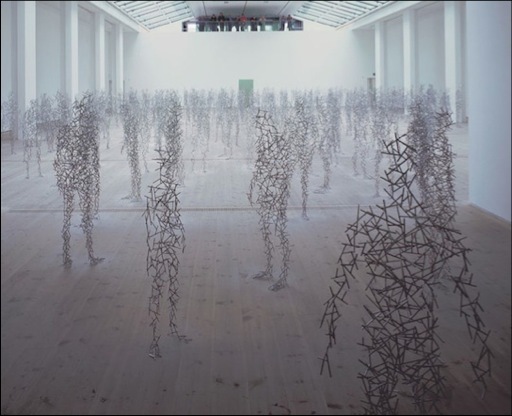 Dissociation experienced by a young neuroscientist during a stroke. A story of courage and hope and a lesson in the plasticity of the brain -- the ability of the brain to heal. “Immediately, I felt a powerful and unusual sense of dissociation roll over me. I felt so peculiar that I questioned my well-being. Even though my thoughts seemed lucid, my body felt irregular. As I watched my hands and arms [on my exercise machine] rocking forward and back, forward and back, in opposing synchrony with my torso, I felt strangely detached from my normal cognitive functions. It was as if the integrity of my mind/body connection had somehow become compromised. ... I felt bizarre, as if my conscious mind was suspended somewhere between my normal reality and some esoteric space. Although this experience was somewhat reminiscent of my morning time in Thetaville, I was sure that this time I was awake. I felt as if I was trapped inside the perception of a meditation that I could neither stop nor escape ..."
The world looks two-dimensional and flat. Objects seem to have no existence separate from my thoughts, they are illusions and are pressed up against my eyes. If I reach out to touch something it seems farther away or closer than it should be. It seems as if there is a filter over my eyes that makes colors less vibrant and makes everything seem darker or dimmer. This sensation is always worse in daylight. On a bright sunny day, it seems there is too much input, too much stimuli from everywhere and for that reason my brain "shuts down" and is unable to take any more input. I wear sunglasses outdoors which seem to help somewhat. I can easily become disoriented in crowds -- again, too much input. I may lose my sense of direction even in familiar surroundings. People and even my pets become merely sound and motion, merely the products of my own mind, though I know they are not. This separation from human contact is excruciatingly isolating. With overstimulation (say in a bustling office-setting) I "can't see what I'm doing." I can see what is in my field of vision and hear what is happening but the input becomes scattered in my head -- the incoming visual and aural stimuli become scrambled. It is like seeing the world reflected back at me in pieces of a broken mirror. Things look fragmented, just sound and motion, and I seem incapable of seeing the whole. I "can't see the forest for the trees" and this is terribly frightening and immobilizing. 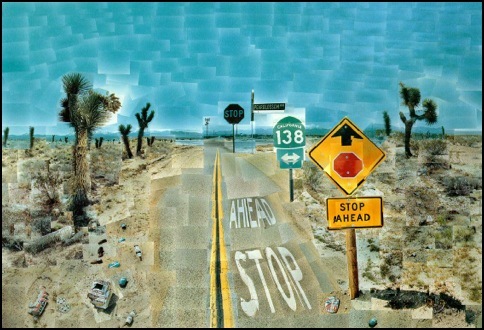 Some of artist David Hockney's wonderful "photographic collages" evoke this scrambling of input. One of his famous works,"Pearblossom Highway" reminds me of this frightening experience. But Hockney's vision must be multiplied at least one-hundred fold to capture the true disintegration of visual input I can experience. My derealization and depersonalization levels seem to be in synch with one another, that is they seem to be one disorder. There are others however who feel only DP or only DR, not both, and that is a difficult concept for me to understand. It is extremely difficult to describe these sensations to someone who has never experienced them, though many people experience them briefly at some time in their lives only for fleeting periods of time, like déjà vu. My DP and DR are constant and this is what makes them so frightening and disabling. I have had these feelings for so long they are almost a part of me, but this does not make them easier to live with; every day I hope for a cure, a miracle, that these feelings will disappear. It amazes me that in 2010, my new extremely astute psychiatric medical resident observed what is probably the root of my overall anxiety -- Social Anxiety Disorder or Social Phobia. No psychiatrist or therapist ever diagnosed this in my lifetime, but it seems to be so on point. From as far back as I can recall, I feared I would disappoint others by failing to meet their expectations, that I would fail, that I would let them down. I felt a terror of being "found out that I was a fake." This affected everything from schoolwork, employment, interactions with friends, co-workers and employers. I was also terrified every time I performed in the theatre, on film, playing the piano, singing. This further damaged my confidence in these areas. I will never know how far I could have gone with these activities; I had talent and a passion for the way I knew how to best express myself. I will never know how far I could have gone in a career in any of these fields. This causes me tremendous despair. I have a myriad of other symptoms that would fall under the definition of GAD, Generalized Anxiety Disorder. I have also had Panic Attacks, more so in my youth, which include "feelings of unreality" -- depersonalization and derealization. Below are the symptoms of Generalized Anxiety Disorder and Panic Attacks from the DSM-IV. I have every symptom listed or have at one time or another. These symptoms wax and wane in severity. “Excessive anxiety and worry [apprehensive expectation), occurring more days than not for at least 6 months, about a number of events or activities (such as work or school performance). The focus of the anxiety and worry is not confined to features of an Axis I disorder, e.g. the anxiety or worry is not about having a Panic Attack (as in Panic Disorder), being embarrassed in public (as in Social Phobia), being contaminated (as in Obsessive-Compulsive Disorder), being away from home or close relatives (as in Separation Anxiety Disorder), gaining weight (as in Anorexia Nervosa), having multiple physical complaints (as in Somatization Disorder), or having a serious illness (as in Hypochondriasis), and the anxiety and worry do not occur exclusively during Post Traumatic Stress Disorder. When I first read this summary of GAD (probably in my late 30's after a psychiatrist mentioned this might be a more proper diagnosis) I was stunned to find that I literally fit every single criteria. I get angry when certain friends say, “Well, if you research this stuff, you will start believing you have it." This truly infuriates me as I had these symptoms as a child -- long before I had any access to such information. That is a stinging insult and is often directed at all individuals with mental illness who wish to learn more. This stigma is not applied to individuals researching a physical illness. I fought these symptoms daily from about sixth through twelfth grade. I have no idea how I managed to function as well as I did but GAD and panic affected every aspect of my life at the time. My schoolwork suffered greatly. What held me together, as noted many times, was the security of my private school and my lifelong passion for the Arts. I wish I had been able to reach out for help but I feared my mother's retaliation -- her endless threats to remove me from this special environment which I believe preserved any quality of life I had or have today. I still have panic attacks, and many symptoms of GAD (my current diagnosis) but they are not as frequent as in adulthood. My chronic depersonalization and derealization seem to have “replaced” these symptoms. I distract myself from other odd sensations related to depersonalization (hundreds of times a day) such as feelings that there is only darkness behind me -- a void. I also feel that I could simply "disappear" at any moment, that I have to "hold myself here" in the world. I feel sometimes as if I were merely a candle flame, so insubstantial I could be snuffed out. My perception of Self is often that fragile. This disconnectedness at times affects my concentration on the most mundane tasks. Reading is difficult. Now and then I can't focus on a simple television show. This has improved over time, but in the past it seriously affected my school-work, social activities, and functioning well in any work environment. I know these thoughts are not logical, they are not normal, they feel like a physical, medical disorder, and I have insight into them. But the feelings are very real to me, the fears are very real; the discomfort is very real and saps the joy out of life. The constant anxiety is exhausting and is certainly a cause for feeling depressed and hopeless. I ... have become, comfortably numb …"
(Many have mentioned to me -- and I agree -- that the lyrics should actually read, "I have become uncomfortably numb." But I have always been touched by this song and felt it expressed my feelings of emotional isolation and the loss of childhood dreams (and adult goals) to mental illness). Chapter 3: "The Disembodied Lady" who suffers from a loss of proprioception. Not for the faint of heart. The protagonist has suffered massive and hideous war injuries. He is merely a torso without legs or arms. He cannot see, hear, smell, or speak. His only means of communication is to bang his head against his hospital pillow. His mind is completely intact, he is completely sane, and yet he is merely "thought" trapped inside a mutilated vessel. His total isolation always reminds me of the horrible isolation of depersonalization. How could he not ask after a time, "What is this lump of flesh that I am? Am I alive or dead? Am I merely existence itself?" Observations regarding the interaction of panic and dissociative states. This really describes me to a “t”. “It is interesting to note, that although depersonalisation and derealisation symptoms are recognised as two of the most common spontaneous panic attack symptoms, the ability to dissociate is not mentioned in the main panic disorder literature. Nor is it mentioned that many people dissociate first and experience a panic attack in reaction to the dissociation. There has been speculation amongst psychiatrists who work in the area of dissociation, that people with panic disorder do in fact dissociate first and then panic, but there has been no substantial research in this area. Which is disappointing. We have been researching this for over 10 years and we know from the feedback from clients and from emails that this is the cause of the panic for so many of people. People who do dissociate have had this ability since childhood, although many people have forgotten they were able to do this as children. This ability can be activated once again as an adult as a result of a major stress and/or not eating or sleeping properly. Some of the research shows a trance state can be induced within a split second. Most of us who have panic disorder are not aware of how we can 'trance out' so easily, and we can then panic when we move into an altered state. Our research also shows that people can experience an 'electric' shock feeling or a burning heat or a tingling heat in these altered states. This also adds to the fear and panic that we are dying or going insane. Another research study shows that people can experience dizziness as a result of derealisation. The research shows it is not so much the derealisation that causes the dizziness, rather it is the magnitude in the change of consciousness that can causes the feelings of dizziness. Many people who experience depersonalisation and derealisation can be woken from sleep with a nocturnal panic attack. Research shows these attacks happen on the change of consciousness, going into sleep, moving into dreaming sleep or to deep sleep or back to dreaming sleep. The change in consciousness during sleep, is similar to the change in consciousness people can experience when they dissociate during the day. Some people with panic disorder are frightened by their ability to dissociate, other people are not. One of the easiest way people can induce a trance state is when they are relaxed and/or when they are staring : out of the window, driving, watching TV, reading a book, using the computer, when talking with someone. Fluorescent lights can trigger a trance state, so too can self absorption. The more absorbed we become, the more we can induce a trance stare.